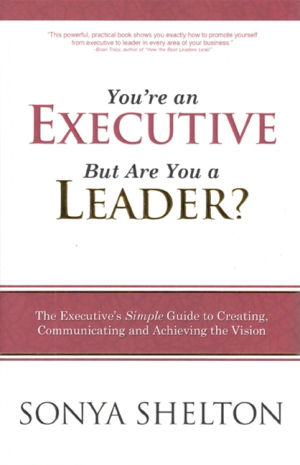 You're an Executive but Are You a Leader? The need for leaders in all aspects of life has never been greater, according to author Sonya Shelton. Her experience in the publishing, advertising, and entertainment industries combined with her consulting and coaching work with small and large corporations worldwide have helped her develop fifty leadership “keys” needed by today’s executives. Compiled into this small, simply designed book, You’re an Executive, But Are You a Leader?, each key is presented on three pages: one holds an explanation of the key, the next presents a case study based on her consulting work, and the last offers questions and writing space for the reader to develop a personal action plan. Also included for each key is a relevant quotation from a world or business leader. The one-page synopsis and the accompanying case study address the basic aspects of each key, but Shelton’s format offers a superficial approach to very complex issues, many of which are the subject of entire books and multiday seminars. The two or three questions posed on the action plan page are a starting point, but won’t provide real help in creating an effective strategy. There are no suggestions of recommended readings or Web sites to search for additional guidance. The author works with individuals and organizations on the very issues that can’t be solved with a few key statements and a short action plan. The opening pages of her book provide information about hiring her as a motivational speaker or consultant; here, the reader will also find a suggestion to purchase the book for others in quantity discounts. As a reminder of key leadership issues, You’re an Executive, But Are You a Leader? might be useful after working with a consultant or coach like Shelton, but alone it cannot effectively help the reader develop meaningful leadership skills. More in-depth examination and explanation of nearly every key is needed.